She was a member of the Student Council and was elected Class Secretary all four years for the Class of 1996. She was in the high school band as a flute player in her freshman year and, she was selected to be a Drum Major in her senior year. She was an Honors graduate who was also involved in the Political Action Club, Spanish Club and Students for Action. “You cannot hope to build a better world without improving individuals. Her compassion for others led to her passion for helping others. Jen worked at the Swampscott Town Library, was a candy striper at Salem Hospital, and participated in the walk for MS. She volunteered at the Swampscott Senior Citizen’s Dance, volunteered at My Brother’s Table and for the American Heart Association and Toys for Tots. As a member of St. John the Evangelist Church, her hometown parish, she was also a religious education instructor. 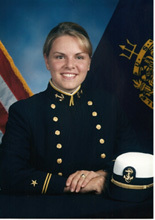 Following graduation from USNA and her commission as a Second Lieutenant in the Marine Corps, Jen went to The Basic School (TBS) in Quantico, Virginia. At TBS, she spent 6 months training and developing the professional knowledge and skills necessary to effectively lead Marines under her command. Courses at TBS included leadership, marksmanship, land navigation, communications, infantry tactics, weapons, drill, military law, logistics, personnel administration, and Marine Corps history. 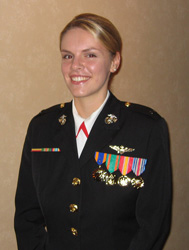 After graduating from TBS, Jen reported to Naval Air Station Pensacola, FL for Aviation Preflight Indoctrination. While there, she completed physical training and courses in engineering, air navigation, aviation physiology and water survival. 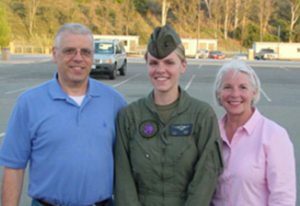 After completing her training, Jen reported for primary flight training at Naval Air Station Corpus Christi, TX where she was trained to fly the T-34 turbo propeller, fixed-wing aircraft. 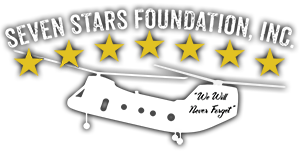 Next Jen was assigned to a training squadron, HMMT-164 in Camp Pendleton, CA, where she learned to fly the CH-46 Sea Knight helicopter, also affectionately known as the Battle Phrog.